1oz (Great Britain) "Brittanias" Gold coin (100 Pounds). Monster box of 100 pieces. The Britannia gold coin was first introduced by the Royal Mint in 1987 in gold. It was popular amongst investors, and in 1997 the Mint launched the Britannia coin in silver. In 2017, the coin was launched in platinum. 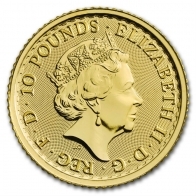 Each British Britannia 1 ounce gold coin has a face value of £100. The front of the coin features an image of Queen Elizabeth II. The reverse features an image of Lady Britannia. She is holding an olive branch and a shield in one hand, and a trident in the other. The reverse of the coin also contains the year of minting. 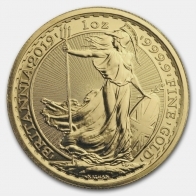 The British Britannia gold coin is available in fractional sizes, including 1/20 oz, 1/10 oz, 1/4 oz and 1/2 oz. The Royal Mint also produce the British Britannia coin is silver in 1 ounce and 1/2 ounce sizes. In addition to the British Britannia series, the Royal Mint also produce the British Sovereign, and the Queen's Beasts series of coins. 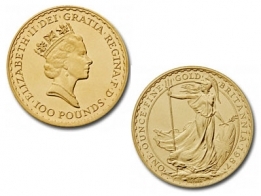 British Britannia gold coins are popular due to their beautiful design and tax benefits. These coins contain 99.99% pure investment grade gold bullion. 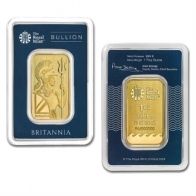 If you are interested in selling gold Britannias, please contact us to find out more.